1861 – Merchiston Castle University of Edinburgh B.A. 1866 – Trinity College Cambridge B.A. 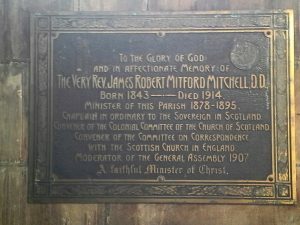 Memorial Plaque for Very Rev Dr James Robert Mitford Mitchell, 19th Patron to the Seven Incorporated Trades, on the South wall of the West Kirk of St Nicholas.